We love a good savory pie, shepherd's, cottage and recently, fisherman's. 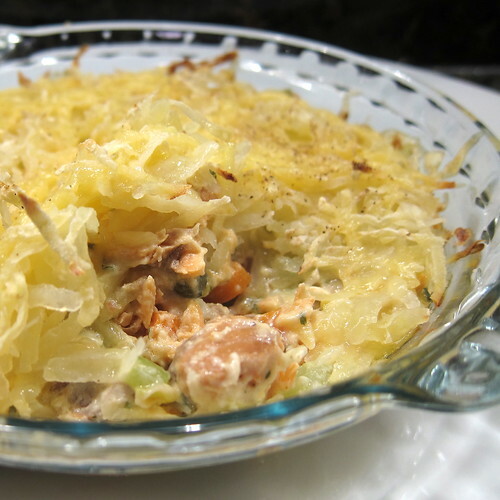 For this version I used smoked salmon in the filling and played on the smokey flavor by also using smoked gouda in the toping. For the filling, I thought of what would make a good salmon chowder, cream, capers, leeks and worked from that idea. I think the two ingredients that really gave the filling its best flavor, other than the salmon of course, were the dried mustard and capers. Both just take a basic cream sauce up a notch with flavor and tang. Matt thought this pie had the perfect ration of filling to topping when we cooked it in two 6" pie pans. He loved it so much he practically licked his clean. This was really great the way it was, but next time I might toss the potatoes in a little olive oil to help them brown more. Or perhaps, give them a quick sauté first. 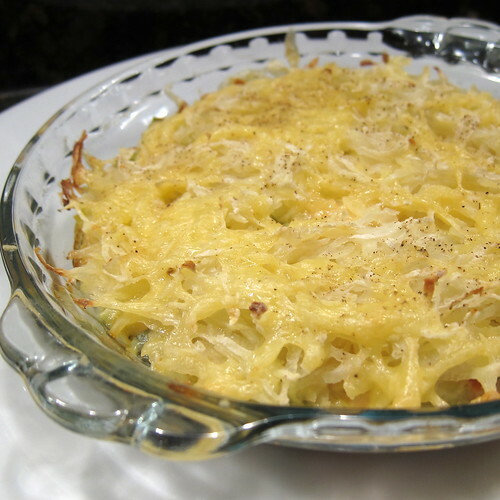 I like the texture of them grated in this instead of using mashed potatoes on top. In a large skillet, heat the oil over medium-high heat. Add the leeks, carrot and celery. Sauté until the carrots are crisp tender. Stir in the cayenne pepper, mustard and parsley. Turn heat down to medium. Sprinkle the flour over the vegetables. Stir for 1 minute. Add the half and half a little at a time. Cook while stirring until thick and creamy. Remove from heat. Stir in the salmon and capers. Taste and add salt and a generous amount of black pepper. Put the salmon filling into two individual or one pie pan. Mix the potato and cheese together. Spread over the filling. Sprinkle a little salt and pepper over the top. Bake for 30 minutes or until the cheese is melted and the potatoes are cooked. Mmmm! I love a fish pie! I am particularly impressed by your grated potato topping, because the only time I tried to do it that way it went grey and horrible. No idea what I did wrong! I am loving this. Especially since smoked gouda is our favorite cheese. Happy New Year! I hope you all had a wonderful holiday. ooooh--the gouda is an inspired choice! Great idea, especially with the cheese and potatoes. Yummy! I have never made a fisherman's pie! But I should!